to be finished from this year's SAGA convention. Of course it is linen. And to make it even better, it has Turkey work! Or Ghiordes knot stitch. I LOVE turkey work. 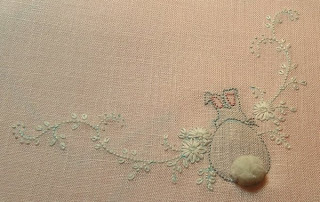 Its the knotted stitch that makes his bunny tail. I also love this little jacket. It is called Baby's First Outing by Wendy Schoen. I plan to adapt it in Swiss flannel for a boy. I think I will work a little giraffe on it. I think this little bunny worked in shadow work is adorable. I didn't realize until I enlarged the picture that I forgot to do the whiskers on one side. Need to fix that before I finish the other pieces. They are all traced and ready to embroider. I love it! My Wendy projects are going to be my first ones to finish as well.